"Kate So Far" wins for Best Television Show! Kate So Far won the Cecil Award for Best Television Show! The awards ceremony took place Friday, May 22, 2009 and many were in attendance. The Cecil Awards began with an interview and a trip down the red carpet, during the awards show there were surprise guests and interviews, followed by an after party with Saints Motel and DJ Yoshi performing. Kate So Far was a pilot shot in January about a high school girl who moves from the East coast to California to live with her sister who she rarely speaks to. This is her journey coping with the lifestyle change, and the rebuilding family ties. The pilot is being submitted to several television oriented film festivals. Please check back for updates! The award was presented by Danielle Fishel and Rider Strong from Boy Meets World. As one of the directors of Kate So Far, receiving the award was quite a surprise and greatly appreciated! Much thanks go to those who supported the project, the wonderful cast and amazing crew. (From L-R) Preston Zeller (Producer), Melissa Kosar (Director), Kyle Berns (Producer), and Heather Schlossnagle (Director/Writer). 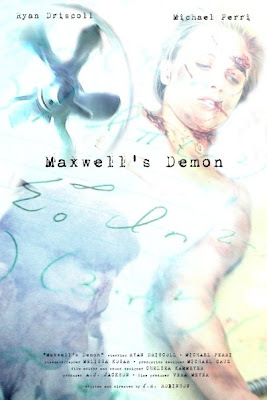 "Maxwell's Demon" has been completed! Post-production on Maxwell's Demon has recently been completed. I shot the short film in the beginning of March on Super 16mm. The film was written and directed by J.R. Robinson and produced by A.J. Jackson. Following the catastrophic failure of his experiment, Max, a young scientist, is thrown backward in time and is forced to try to rewrite history, by convincing his girlfriend, Eve, to sabotage his work. Check back for updates on Maxwell's Demon!